Price from: $1024 - Book now! Welcome to Phnom Penh, the recent capital of the Khmer kingdom. Upon your arrival at Phnom Penh’s international airport, you will be greeted by your guide and transferred to your hotel. Enjoy the rest of day at your leisure to recover from the jetlag or explore the city on your own. After enjoying breakfast at hotel, join us on a full day sightseeing tour that covers all the key attractions. Start with the Royal Palace which is regarded as the nation symbol and home where the royal family live. Next, move to the National Museum- an introduction deeper into ancient Khmer art and civilization. Continue to the top of Wat Phnom and have your fortune told. In the afternoon, focus on the national recent history by a tour to the Tuol Sleng Genocide Museum, which documents atrocities committed by the Khmer Rouge in the 1970s – a chilling window into Cambodia’s violent past. Finally, try out your bargaining skill at Phnom Penh’s airy Central Market. Transfer back to the hotel where you will spend the rest of day on your own. 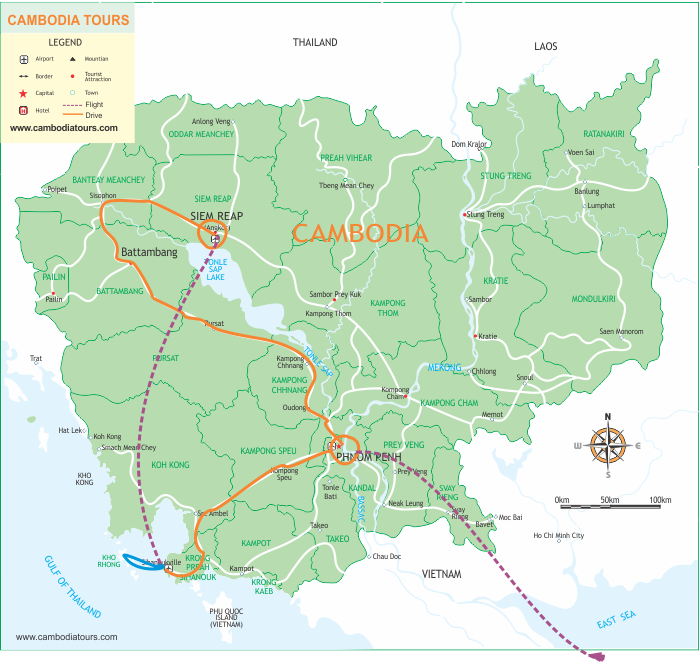 Day 3: Phnom Penh - Oudong - Battambang. After breakfast, we travel to Battambang, Cambodia’s second largest city. On the way, you will visit Silversmith village, Oudong Mountain, and Pottery Village in Kampong Chhnang province. Upon arrival in Battambang, enjoy a walking tour through the city’s bustling boulevards lined with quaint French colonial buildings. Spend the day exploring Battambang and its surrounding countryside. After breakfast we start our day visiting the local marketplace, then head out of town to visit surrounding Angkorian and post-Angkorian temples, including Wat Ek and Wat Toul Bassaet. Then explore the Bat Cave and visit some local Khmer Villages. In the afternoon, leave Battambang on a 3.5 hour car ride for Siem Reap. On arrival in Siem Reap hotel, check in and free at your leisure. You are recommended to visit the nearby Old market and Pub Street on your own. Breakfast at hotel followed by an exploration of Angkor Thom, first start with its South gate which is famous for its majestic doors and artifacts. Then, go further to the heart of Angkor Thom where you will visit the monumental temple of Bayon facing the tropical forest and Baphuon and Phimeanakas mountains, elephant terrace and Terrect of the Liper King, Takeo "Jewel of Crystal" is dedicated to the Hindu God Shiva and was erected at the end of the 10th century. Continue to Ta Prohm temple which is a wonderful combination of human genius and natural beauty. Giant trees have grown there for centuries. In the afternoon, visit Angkor Wat, the 7th World heritage wonder, its founder was Suryavarman II who reigned Cambodia from 1113 to 1152 and built the five towers in the 12th century and dedicated them to the Hindu God Vishnu. The plan of the pyramidal conception of the temple combined with spaces, alleys, ditches is an ancient masterpiece of architectural design and construction. After exploring the astonishing Angkor Wat with your guide, it will be time to head to Bakheng Mountain to watch the sunset. From a height of 65 meters at the top of the hill, you will witness the most spectacular views of the temple complex against the backdrop of changing colors in the evening sky. This morning, join us on a half day cooking class to discover the secrets of authentic Khmer cuisine. Begin with a guided walk in the local wet market where you will learn about Cambodian vegetables, herbs, and other ingredients before returning to the classroom for a hands-on culinary experience. Sample your efforts then transfer to Tonle Sap where you will board a traditional wooden boat ride visiting the floating villages. Tonle Sap is the largest permanent fresh-water lake in South Asia and flows into Tonle Sap River, joining the Mekong in Phnom Penh. On the way back to your hotel, stop at one of the city’s lively open markets, Psar Chass, called the “Old Market”, where you can discover more about the local life! After breakfast at hotel, our driver will take you to Siem Reap airport for your short domestic flight to Sihanouk Ville. Upon your arrival, the driver will wait you at the airport and transfer to the pier where you catch the local speedboat to Koh Rong Samloem. Check in and relax then. Accommodation: Hotel in Koh Rong Samloem. You will have one more day free to explore this beautiful island. You can just enjoy yourself at the beautiful beach or perhaps, you may contact with the hotel for the arrangement of the following activities. Have breakfast at hotel then transfer by the local speedboat back to main land where you will meet your driver at the dock for 3.5 hour transfer to Phnom Penh. Enjoy your last night at our bustling capital. After a breakfast at the hotel, you are free for shopping or relaxing until our driver will drive you to the airport for departure. Thanks for your kind request. Our travel consultant Ms. Mary D will contact you via email and phone number for more information of this tour. we'll thank you information about hotels in 4 and 5 stars category . We will send you details for 4 and 5 star hotels via your email address.